If i buy a iphone 6 from a Uk store or amazon for example can i put a three sim in it?? If the phone is unlocked it will work fine, if you buy from i.e. a Three UK store (or any other operator) the phone will be locked and you will have to get it unlocked somehow. i.e. if you bought this one, it should be ok.
Post a link here on what your thinking of buying. The words your looking for are "Sim-Free" or "Unlocked"
Oh and make sure it's not a used phone, as in from a private seller as you could end up getting burnt! Not all US iPhone models support data transfer technology suitable for your region, and, as a result, such an acquisition will be a complete disappointment for active Internet users. Smartphones that are sold at a price several times smaller than the market, as a rule, are specifically tailored for SIM-cards and tariffs of a particular cellular operator. With another SIM, they will not work. Thus, the low base price becomes a kind of initial loan installment with monthly payments to the telecom operator. Of course, the site will have the necessary information about it (or a clickable link to it), so it is important to carefully read all the information about the product in order to correctly understand the terms of such a transaction. If you are serious about buying an iPhone on Amazon, you should learn more information on the net, you'll find lots of essays, in which people write about their experience. Also, you can find a professional "buyer", who will help you make a purchase, but better buy it in the official store. Good luck! Apple’s decision to add dual-SIM support to some of its iPhones this year is proving popular for all manner of reasons, but if you don’t want to buy a brand new iPhone there has to be a way to get in on the action. That’s where this dual-SIM Box comes into play, and it’s quite the little box of tricks. A little hockey puck-sized affair, this box has slots for two nano SIM cards, with ports on the back for power and Ethernet. 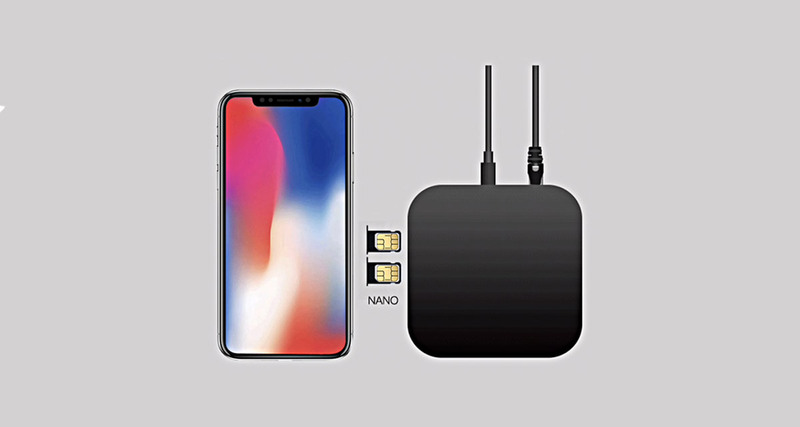 That’s all there really is to it, and with two SIM cards installed users are able to take advantage of the cards remotely no matter where they are in the world, so long as they have Internet access. That means that they can make calls and send text messages all while also having a dedicated SIM in their phone, too.